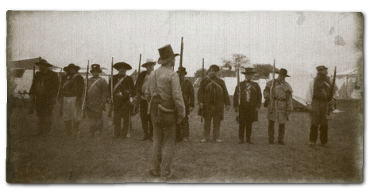 The Refugio Militia was a living history organization with members from all over Texas. We portrayed a militia unit that existed in the 1830's from the town of Refugio. We were formed to be an organization interested in the education of members and the general public on the topic of the Texas War for Independence. We worked in concert with other progressive groups and re-enactors to develop events and re-enactors to become more progressive in their interpretations for the public and themselves. The town of Refugio was the colonial seat of the Power-Hewetson colony founded in 1834. The majority of the men that made up the colony and its militia, also founded in 1834, were of Irish descent.When the Mexican government approved Power’s grant, they reached an agreement that fifty percent of the colony’s population would be of Irish descent and the other fifty percent would be made up of Tejanos. Regardless of their trade, it was common during the 19th Century for men between the ages of eighteen and forty to have served in the civic militia. Many communities even made it mandatory for citizens to serve in the militia. These civic militias would serve as a National Guard force and an auxiliary arm of the national Mexican Army. As Santa Anna came to power as a Centralist dictator in 1834, he demanded that all civic militias be disbanded and their arms be returned to the government arsenals. This created civil unrest throughout Mexico and Santa Anna responded with military violence. Texans were unwilling to comply with this demand which resulted in the Mexican campaigns into Texas to regain control of cannons given to the colonist to guard against Indian raids. Texans were strong supporters of the Republic of Mexico and the rights given to them under the Mexican Constitution of 1824 and believed that these demands went against the laws they were accustomed to living under. For more Refugio Militia history go to our 'Files Page"